Pioneering Vodafone Live Music property creation - We Are Fearless | Boldness with backup. 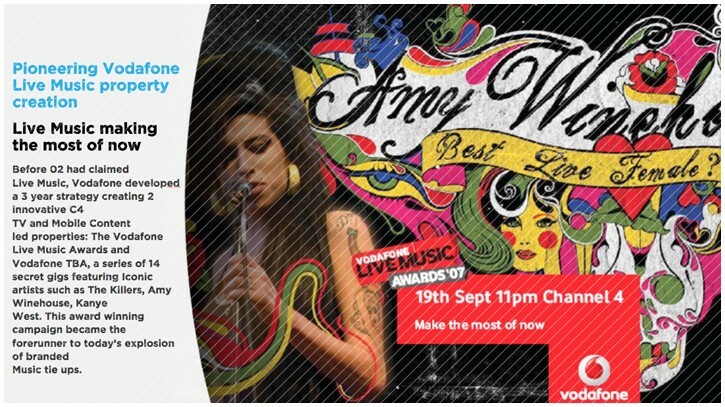 Before 02 had claimed Live Music, Vodafone developed a 3 year strategy creating 2 innovative C4 TV and Mobile Content led properties: The Vodafone Live Music Awards and Vodafone TBA, a series of 14 secret gigs featuring Iconic artists such as The Killers, Amy Winehouse, Kanye West. This award winning campaign became the forerunner to today’s explosion of branded Music tie ups.